Elizabeth actually fell sick again these few days. And, is not easy to take care of a sick 9 months old as she will suddenly wake up in the middle of the night. And, she is not up for milk but for the sake of uncomfortable or due to separation anxiety. Yeah… once they realized that they are actually a separated beings from their mum, they are really sticky to mummy, especially breastfeed baby. And, of course situation get worst when they are uncomfortable while having flu. These few nights, Lizzy will suddenly stand up from her play pan and signal us to carry her or she will just cry and insist that she wants us to carry. Unfortunately, this is not the end of the story yet. Sometimes, she will not back to sleep even though you already hold her in your arms or let her fall on your shoulder. She might wants to roll on mummy’s bed and play with daddy. Also, this might last for more than an hour. Scary isn’t it? But, when our precious one get sick, all we ask for is to see her back to healthy again. That’s all. We just won’t mind to sacrefies a few nights of our sleeps. In fact, mummy hardly sleep too when Lizzy was having fever not long ago cause we all know that high temperature might cause brain damage. So whenever our baby have fever, we might stay up all night long to swap our baby to lower the temperature or keep tracking the temperature every now and then just to make sure it does not gone up too high. Frankly, it is terribly tired to take care of a sick baby. But, I think the one who is sick always suffered the most. And worst for a baby as they can’t tell. That’s what make the mummy so worry. The worries is always greater than the tiredness. Anyway, I laugh not because I think it’s funny. I am really so happy to see her walking even though is only 2 steps at the moment. *Tears rolling in Healy’s eyes* One of reason I am getting so excited, may be it’s because this is something I never expect. Not now at least. I thought she will take another 1 or 2 months to walk. But… She just did it! Truly amazing! Mummy is so proud of you, my little darling. You are such a brave girl, wonderful! Look at her… gorgeous isn’t it? However, it’s a pity that I can’t snap to moment she is walking… Anyway, I am not giving up. Still working on it. At least snap a pic that she is standing on her own 2 feets. 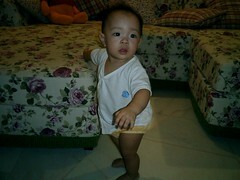 If there is something for her to hold, she is walking quite smooth now. Normally she will walk by holding the sofa, wall, chair… Basically anything that has a grip. And, if I offer to hold her two little hands, she get really excited and seems running rather than walking slowly! LOL! Such a playful girl, is it brave or wild? However, now she can only step out 1 or 2 steps, then she will squad down once she realized it’s shaky. So far, I am quite amaze with her progress. And, everything seems moving so fast now, her speech, her action, her understanding… Thus, I set up this new blog as I want to mark down every of her daily progress without miss. I guess all mummies are the same. Every new thing that our baby had learn will become a moment for celebration to us, isn’t it? So, cheers with me, k? However, I just can’t wait any longer. I will have to start blogging now. I will change the theme later….. cause there is a big news need to be announce , right now! Just hope to the next blog and check it out what is so big, ok? This is already Elizabeth’s 9 months 3rd week. 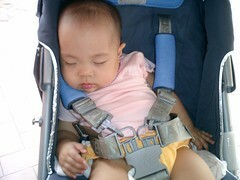 I have sign up for baby center since she was very young. I think that’s when she was about 3 months old. And, I find it’s weekly free newsletter very useful. I never miss any of it so far. This week I have refer to it’s “common cold” section as I want to learn more about this topic ever since Elizabeth got her first cold. I have learn that a cold may last up to 10 days. Frankly, I never expect that long. Also, baby normally learn how to blow their nose after 4 years old. I thought it could be earlier in this case. hahaha…. My maid is going home is a few weeks time. I am so worried! Really! 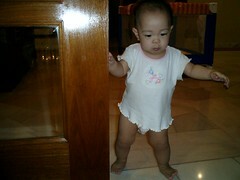 Nowadays, My sticky lil naughty can almost crawl through the whole house within 30 minutes. And, she will prefer to walk around if I can hold her. And, Just kindly count and see there are how many 30 minutes in a day? Is not that I am not willing to do that, that’s just too tiring. I got to bend down my upper body and squad a little for getting the correct level to hold her. Trust me, that ain’t easy at all! Yet, she will get really demanding when she is with me. She will keep instructing her mummy to go here and there to get what she wants. And, she just never end in changing her wants. She will get bored with the thing on her hand within 10 minutes (30 minutes if she is with my maid, she just know how to bully her mummy, isn’t she?). And again, how many 10 minutes in a day actually? Normally, I will bathe her, feed her, and play with her or read for her a few times in a day, each time is about 30 minutes. Also, I will walk her in the garden sometimes. Lastly, I will roll with her on the bed before she sleep. That already took up at least half of my day. However, I still got some free time to blog. And, spend an hour to watch TV or read. This is the sweet parenting moment I have with a maid around. Imagine my maid is not going to be around for 10 days. Yeah! 10 days. Go home to Indonesia for her Raya. Yet, my mum is quite busy nowadays. I am almost only on my own taking care of Elizabeth for that 10 days. Yet, who is going to sweep and mop the floor everyday? OMG, there are so many other home chores… who is going to do that? And, God please bless me. Just make sure she will come back to continue her third year as she promised. Or else… OMG! I just can’t imagine how am I going to survive without a maid! I know most of you is going to laugh at me. Laugh as long as you wish! Just remember to pray together with me for her to come back and work. Or else… I will have to disappear from the blog sphere forever. Don’t you going to miss me? For sure, I am going to miss you guys so much! Even for 10 days. I hope I still manage to blog within that 10 days even though she is not around. With an active 9 months old around, life without a maid is nearly no life at all. You’ll never have time for your own anymore. That’s scary…. See… I can climb up the potty to get higher now. If there is still some other things for me to climb, I can even climb higher than this! hahaha…… How come I am so clever? Unbelievable, right? Wahahahaha…….. These few days Elizabeth was sick. She got flu this time. Yeah… almost immediately after she recovered from her fever. However, it is not that serious, and she is almost fully recover now. But, still she was irritated by her blocked nose for the last few days. She can’t sleep well in the middle of the night, she keep grumbling every now and then throughout the night. And, She will cry insist to sleep on my bed instead of her own. Daddy… I love you! I like this house and the colorful balls so much! Love You, Love You, Love you! 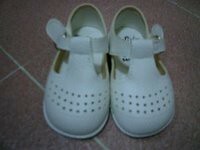 Yea… Daddy bought this for her last Friday while waiting for mummy to finish my hair wash. Thinking of surprising her and make her happy after all she had suffered so much in the hospital. It’s from Toys”R” Us. Buy for her… And also, play together with her! Just another “Daddy & Elizabeth” time. However, despite her naughty deeds, don’t you think she is brave and determined? hehe… Sorry for being so proud! She’s my girl! Just can’t help being proud! hahahahaha….